"ليدن" تحوّل إلى هنا. لمطالعة استخدامات أخرى، انظر ليدن (توضيح). لَيْدَن ( /ˈlaɪdən/; النطق الهولندي: [ˈlɛi̯də(n)] ( استمع) أو لاَيِدَن في بعض الكتابات) Leiden مدينة بمقاطعة جنوب هولندا من هولندا. The municipality of Leiden had a population of 123,856 in August 2017, but the city forms one densely connected agglomeration with its suburbs Oegstgeest, Leiderdorp, Voorschoten and Zoeterwoude with 206,647 inhabitants. 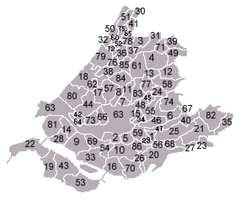 The Netherlands Central Bureau of Statistics (CBS) further includes Katwijk in the agglomeration which makes the total population of the Leiden urban agglomeration 270,879, and in the larger Leiden urban area also Teylingen, Noordwijk, and Noordwijkerhout are included with in total 348,868 inhabitants. 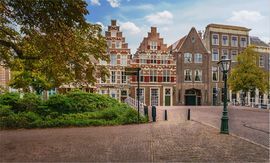 Leiden is located on the Oude Rijn, at a distance of some 20 kilometres (12 miles) from The Hague to its south and some 40 km (25 mi) from Amsterdam to its north. The recreational area of the Kaag Lakes (Kagerplassen) lies just to the northeast of Leiden. 17th century houses along the Herengracht. 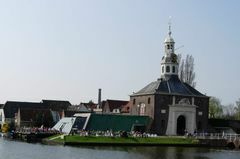 Leiden was formed on an artificial hill (today called the Burcht van Leiden) at the confluence of the rivers Oude and Nieuwe Rijn (Old and New Rhine). In the oldest reference to this, from circa 860, the settlement was called Leithon. The name is said to be from Germanic *leitha- "canal"  in dative pluralis, thus meaning "at the canals". "Canal" is actually not the completely proper word. A leitha (later "lede") was a human-modified natural river, partly natural, partly artificial. Leiden has in the past erroneously been associated with the Roman outpost Lugdunum Batavorum. This particular castellum was thought to be located at the Burcht of Leiden, and the city's name was thought to be derived from the Latin name Lugdunum. However the castellum was in fact closer to the town of Katwijk, whereas the Roman settlement near modern-day Leiden was called Matilo. The landlord of Leiden, situated in a stronghold on the hill (motte), was initially subject to the Bishop of Utrecht but around 1100 the burgraves became subject to the county of Holland. This county got its name in 1101 from a domain near the stronghold: Holtland or Holland. 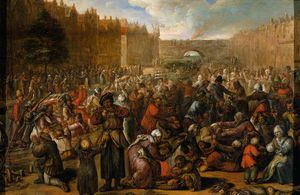 Leiden was sacked in 1047 by Emperor Henry III. Early 13th century, Ada, Countess of Holland took refuge here when she was fighting in a civil war against her uncle, William I, Count of Holland. He besieged the stronghold and captured Ada. Leiden received city rights in 1266. In 1389, its population had grown to about 4,000 persons. In 1420, during the Hook and Cod wars, Duke John III of Bavaria along with his army marched from Gouda in the direction of Leiden in order to conquer the city since Leiden did not pay the new Count of Holland Jacqueline, Countess of Hainaut, his niece and only daughter of Count William VI of Holland. Burgrave Filips of Wassenaar and the other local noblemen of the Hook faction assumed that the duke would besiege Leiden first and send small units out to conquer the surrounding citadels. But John of Bavaria chose to attack the citadels first. He rolled the cannons along with his army but one which was too heavy went by ship. By firing at the walls and gates with iron balls the citadels fell one by one. Within a week John of Bavaria conquered the castles of Poelgeest, Ter Does, Hoichmade, de Zijl, ter Waerd, Warmond and de Paddenpoel. On 24 June the army appeared before the walls of Leiden. On 17 August 1420, after a two-month siege the city surrendered to John of Bavaria. The burgrave Filips of Wassenaar was stripped of his offices and rights and lived out his last years in captivity. The city's biggest and most popular annual festival is celebrated at 3 October and is called simply 3 Oktober. The people of Leiden celebrate the end of the Spanish siege of 1574. It typically takes place over the course of two to three days (usually two but three if there's a Sunday involved) and includes parades, a hutspot feast, historical reenactments, a funfair and other events. The city has recently started to host the Leiden International Film Festival, the fastest growing festival of its type in the Netherlands. 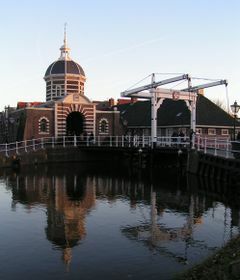 Leiden has important functions as a shopping and trade centre for communities around the city. The University of Leiden is famous for its many discoveries including Snells law (by Willebrord Snellius), the famous Leyden jar, a capacitor made from a glass jar, invented in Leiden by Pieter van Musschenbroek in 1746. Another development was in cryogenics: Heike Kamerlingh Onnes (1913 Nobel prize winner in physics) liquefied helium for the first time (1908) and later managed to reach a temperature of less than one degree above the absolute minimum. Albert Einstein also spent some time at Leiden University during his early to middle career. The city also houses the Eurotransplant, the international organization responsible for the mediation and allocation of organ donation procedures in Austria, Belgium, Croatia, Germany, Luxembourg, the Netherlands and Slovenia. Leiden also houses the headquarters of Airbus, a global pan-European aerospace and defence corporation and a leading defence and military contractor worldwide. The group includes Airbus, the leading manufacturer of commercial aircraft worldwide. CORPUS Opened on March 14 2008. ^ Jona Lendering. "Towns in Germania Inferior: Lugdunum (Brittenburg)". Livius.org. Retrieved 11 June 2010. ^ Film & Television Coll Europe. Routledge. 2012. p. 315. ISBN 978-1-135-10295-1. ^ Dawson, Nick (28 September 2013). "Leiden International Film Festival Announces New US Indie Competition". Filmmaker Magazine. Retrieved 8 October 2013.